Yellow USB flash drive with silver housing. The housing not only offers protection for the flash drive, but also provides added functionality with the practical small key ring to attach the USB flash drive to your keys. Highest speed in the smallest format ! The USB stick 3.0 with rotatable aluminium and Opel flash print is the practical mobile memory for your data. The clear, almost purist form, the well thought-out details and the professional functions are rarely found in this combination. In addition to cast pliers, a blade, a saw and much more, the reliably lockable glass breaker with bit adapter and 9 bits is impressive. The hexagonal wrench integrated in the handle and the nail puller round off its great functionality. The multitool is finished with a subtle laser-engraved Opel lightning bolt on the handle and a silver Opel lightning bolt print on the belt pouch . 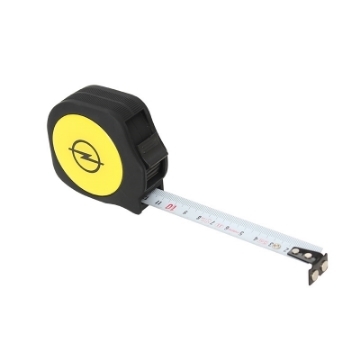 A very light and practical measuring tape especially for professional use. The housing encases the innovative inner workings that redefine the "pocket measuring tape" product category. Tape precision according to EC II. The measuring tape is also equipped with a belt clip. The perfect light source in all situations and always on hand thanks to its compact design: on journeys, for leisure, breakdowns or DIY work. The ultrabright 3 Watt high-power LED ensures the perfect illumination on every occasion. With up to 150 lumen, it is 150 times brighter than conventional LEDs. The light range and light beam is adjustable with the zoom function. The elegant, robust aluminium casing with Opel lightning bolt engraving and practical carrying loop rounds off this quality product. CE and RoHS-certified. Includes 3 AAA batteries. Always have light when you need it at work. The robust and practical LED workshop lamp with printed Opel lightning bolt satisfies the highest quality (CE and RoHs-certified), brightness and durability demands. Thanks to its rubberised surface, it also fits perfectly in the hand. 3 AAA batteries are included in the delivery. This compact laptop case made out of black, durable neoprene with yellow piping and black graffiti lightning bold print logo protects notebooks from dust, bumps and scratches. Fits 14" devices and similar.